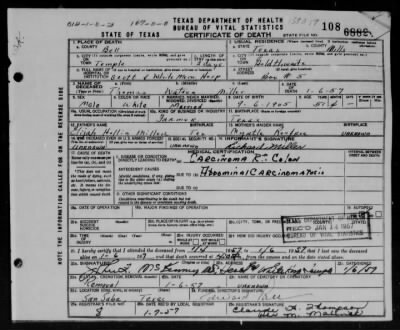 Official death certificates from the Texas State Board of Health, Bureau of Vital Statistics for the years 1890-1976. These records are searchable by first and last name of the deceased, year, county, and city. A certificate may include the decedent's date, place, and cause of death; age; date of birth; last residence; and marital status. If known, it will also include occupation, birth place, parents' names, and place of burial. Browse by county, then year, then surname, beginning with the first letters of the last name of the person you seek. If unsure of the year or location, use the search box under the browse menu.